40GW of European nuclear capacity is scheduled to close by 2040. But 3 key incentives are aligning to suggest a policy shift towards major life extensions. France has reignited the debate around nuclear power plant closures in Europe this month. The French government has just reneged on its promise to reduce the nuclear share of generation output from 75% to 50% by 2025. Why? Nuclear closures of that scale and pace cannot realistically be replaced by renewable generation. So the practical impact of the closure policy would have been to commission a fleet of new gas-fired plants in order to maintain security of supply. France’s decision may mark the start of shift towards a more pragmatic stance on nuclear life extensions across Europe. North West Europe could lose more than 40GW of nuclear capacity, based on the current retirement schedules of regulators and policy makers. And this is after accounting for the recent French policy shift. In Chart 1 we show closures across Germany, France, UK and Belgium. This does not include other European markets also planning to close nukes such as Sweden and Switzerland. All German reactors are closed by 2022 as currently scheduled. UK reactors close at the end of their currently regulatory approved lives (accounting for EDF life extensions granted in 2016). Belgium closure of Doel & Tihange plants between 2023-25, consistent with 2015 legislation. France closes 16GW of nuclear capacity by 2030, broadly consistent with achieving the 50% output target (with closures focused in 2025-30 period). It is important to note that the chart is not our projection of what is going to happen. We expect a significant policy shift to reduce and delay nuclear closures via life extensions. We set out the logic behind this below. Germany permanently closed 8GW of nuclear plants after the Fukushima disaster in 2011. The closure of the remaining 11GW of German reactors by 2022 looks politically difficult to reverse. Yet Germany is a case study of the unintended consequences of rapid closures. German nuclear output has predominantly been replaced by incremental coal-fired generation, either from within Germany or imported from its Eastern neighbours. This is a key factor driving Germany towards a substantial miss of its 2020 emissions target, with a projected deficit of more than 100 mt per year of CO2. 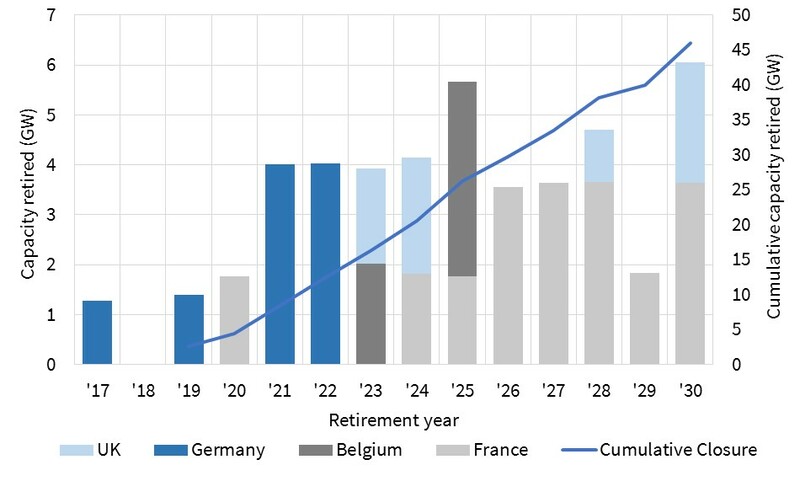 Closures are also causing major transmission stress issues, supporting the life extensions of thermal assets via Germany’s strategic reserve mechanism. There has been a degree of political dishonesty in the German nuclear debate, whether intended or otherwise. The proposition put to the German people was the replacement of nuclear plants with renewables. This has not been the outcome, despite Germany’s major ramp up in renewable investment. And it was unrealistic to suggest it could have been. The key fact that is being glossed over in the political debate, is that the closure of a nuclear plant requires a much larger replacement volume of renewable capacity to maintain security of supply and carbon neutrality. European security of supply standards are based on an equivalent firm capacity logic, where different types of plants are de-rated based on output and availability. Nuclear typically receives a capacity credit of around 84%, wind around 22%. So for example replacing 40GW of nuclear plants with wind alone requires 150GW of incremental wind capacity development in order to maintain the same level of system security of supply. In practice, nuclear closures are being replaced by a combination of renewables and fossil fueled output (whether domestic or imported). But the incremental impact of closures is heavily skewed towards fossil fueled plants, given cost & resource constraints around the rollout of renewables. The German closure case study is starting to unveil these inconvenient facts. As a result, we believe other European countries are likely to shift towards a more pragmatic approach. This month’s decision by the French government is evidence of that shift. 1. Decarbonisation: Europe is pushing to lead the global decarbonisation effort. Removing an existing high load factor, low carbon source of generation is akin to chopping off a limb before going into battle. Germany is evidence of the fact that closing reactors makes emissions reduction much harder. 2. Security of supply: There is very low public and political tolerance for blackouts. Closing baseload nuclear plants at the pace projected in Chart 1 creates a major system capacity deficit. This cannot practically be filled by wind and solar at the rates required. This precipitates a requirement to build new gas plants with economics lives of 20-25 years, at least until load shifting batteries can be rolled out in scale. This does not help with decarbonisation. 3. Commercial: Nuclear plant owners are commercially incentivised to extend lives (e.g. EDF is pushing for at least 10 yr extensions across its fleet). Most nuclear plants are currently very profitable given low variable costs. The commercial incentives of larger commercial and industrial consumers of electricity are also aligned, given the competitive implications of higher power prices caused by nuclear closures. The nuclear versus renewables debate has become too polarised. The nuclear industry is preoccupied with trying to demonise renewable intermittency. And a dogmatically anti-nuclear ideology dominates the renewables lobby. Europe should be focusing on closing coal not nukes if it wants to decarbonise. And that is a path that suits both nuclear and renewables supporters well. Looking forward, Small Modular Reactor (SMR) technology may transform public perceptions of nuclear safety over the next ten years. As this technology matures, the orderly replacement of Europe’s nuclear fleet looks increasingly viable. Life extensions are the bridge that buys time for this to happen. A 10 year life extension of the non-German nuke fleet could push 30 of the 40GW of closures from the 2020s into the 2030s. If Germany changed tack this could be more than 35GW. Buying 10 years of low carbon innovation and cost reduction is not a pro-nuclear standpoint. It is common sense.